In January, we reported that Studio a+i won the international competition to design the AIDS Memorial Park in the West Village but their original design, while breathtaking, was denied by community members this spring. Not to be discouraged, the team went back to the drawing board and has just unveiled their latest idea - a beautiful triangular trellis that will shade the 1,600 square foot plot near the old St. Vincent’s hospital and serve as a place of reflection and meditation. In January, we reported that Studio a+i won the international competition to design the AIDS Memorial Park in the West Village but their original design, while breathtaking, was denied by community members this spring. Not to be discouraged, the team went back to the drawing board and has just unveiled their latest idea – a beautiful triangular trellis that will shade the 1,600 square foot plot near the old St. Vincent’s hospital and serve as a place of reflection and meditation. Studio a+i’s first design called “Infinite Mirrors” was a fenced in forest of reflecting glass walls. Material and safety issues aside, the memorial focused on the multitude of people lost due to the AIDS pandemic. The latest design has been praised as a much more quiet and abstract approach – a subtle and soft reminder of the numerous AIDS victims. The trellis vines celebrate growth and life while a circular cut-out allows the sun to shine into a reflecting pool carved with inspirational quotes. The structure is at the same time a comforting canopy and an outdoor sculptural experience. 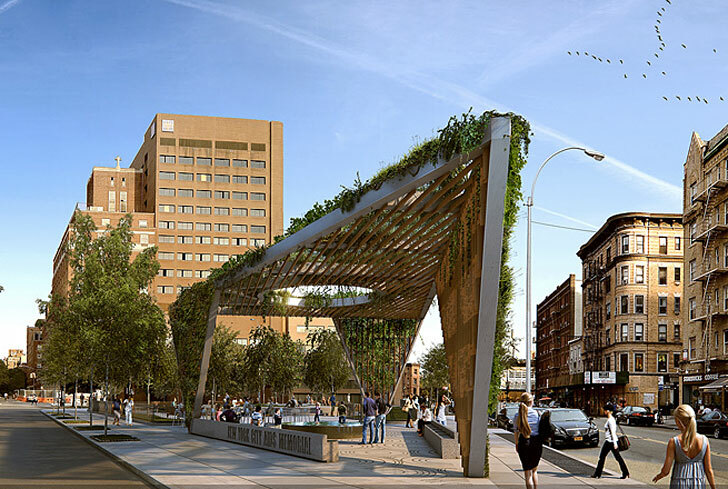 We love the new design for its beautiful green solution to both memorialize New Yorkers and invigorate the rebuilding of the St. Vincent’s area. Studio a+i's first design called "Infinite Mirrors" was a fenced in forest of reflecting glass walls. Material and safety issues aside, the memorial focused on the multitude of people lost due to the AIDS pandemic. The latest design has been praised as a much more quiet and abstract approach - a subtle and soft reminder of the numerous AIDS victims. In Studio a+i's new design, trellis vines celebrate growth and life while a circular cut-out allows the sun to shine into a reflecting pool carved with inspirational quotes. The structure is at the same time a comforting canopy and an outdoor sculptural experience. We love the new design for its beautiful green solution to both memorialize New Yorkers and invigorate the rebuilding of the St. Vincent's area. In January, we reported that Studio a+i won the international competition to design the AIDS Memorial Park in the West Village but their original design, while breathtaking, was denied by community members this spring. Not to be discouraged, the team went back to the drawing board and has just unveiled their latest idea - a beautiful triangular trellis that will shade the 1,600 square foot plot near the old St. Vincent's hospital and serve as a place of reflection and meditation.